Contrary to popular commentary about its unbelievable cleanliness, extremely low crime rates and amazing efficiency, not everything in Singapore is perfect. Believe it or not, there actually is occasional litter on the sidewalks, you may come across a police notification informing residents that a bicycle has been stolen, and you might even find yourself waiting for a delayed train from time to time. Quelle Horreur! Yes, there are some imperfections in the "Disneyland-like" facade of the city, but what would you expect in a city of more than 5 million people? Personally, I think you have to hand it to the Singaporeans...they don't let these blemishes get them down and they are typically addressed head on! I first noticed this as I watched the 2013 National Day Rally, during which Singapore's Prime Minister, Lee Hsien Loong, outlined government policy and programs for housing, education and healthcare reform. Sound familiar? 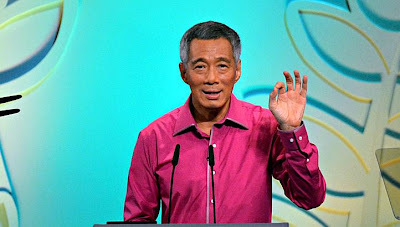 Prime Minister Lee actually described specific policy: for example, providing 25 minutes of detail on the actual cost of new housing in a specific housing complex as well as providing details on healthcare coverage thresholds and rules for new school choice programs. No discussion on foreign policy, funding Middle East regimes, or whether or not the military should be involved in the rest of the world's issues. No discussion on gun control, legalization of drugs, or undocumented workers etc. It's illegal - end of story. Obviously, it's a little easier to manage a country of Singapore's size, age, population and border situation - but still, it was interesting to see the difference in approach and content. While the speech itself was clearly designed to address the average Singaporean's concerns about their life, their children, and their future, it's only one part of the country's approach to resolve the concerns of Singapore's residents. 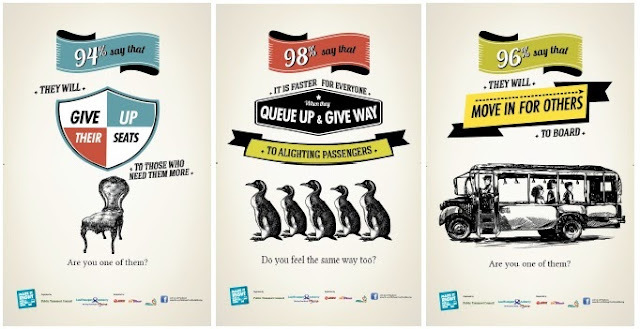 Another tool, very often on display in Singapore are the various government and local company Public Service Announcements (PSAs) that do their best to address several other "issues" across the country. Some advertise new incentives or solutions to some of the biggest domestic issues - while others simply try to influence behavioral change among the residents. Either way, a heavy dose of PSAs are in action across the country. The public transportation system in Singapore is cheap, clean, safe and efficient - but I get the impression many local residents expect even more. Ridership is estimated at 2.6 million on the MRT (train system) and 3.4 million on the bus system daily. With more than 100 trains traveling through 102 stops across about 90 miles of track, typical wait times are only 3-4 minutes. Rush hour trains do, however, get crowded from time to time....so I guess this PSA, encouraging residents to travel early for reduced fares, is an effort to address the rare over-crowded conditions. Move in once you get on the bus, allowing space for others to get on behind you. Personally, I haven't really found any of these situations to be a problem, but I guess I'm not on the buses and trains with the other 6%, 2%, and 4% (respectively) of Singaporeans who don't follow these rules. Though this is obviously a very serious subject, the ads encouraging women to protect themselves from "predators" and to report abuse would be laughable if they weren't so creepy! Perhaps not surprisingly, these ads have received international attention because the of nature of the ad - which many point out as innapropriate because they portray women as "at fault" for the abuse. I don't necessarily see that - I see them as a reminder that there are creepy people about, so watch your back! Again, the subject matter is no joke, but who volunteers to be the man photographed for this ad?? Might want to get a new agent, buddy. 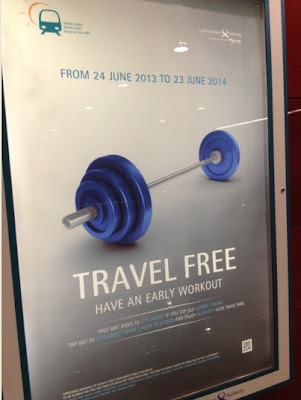 By far, however, one of my favorite knee-jerk reaction ad campaigns, is the "Happy Everywhere" television ad put out by one of the local cable television / mobile phone providers, Starhub. In 2012, according to some Gallup study on how emotional the citizens of various countries are, Singapore was rated the least emotional country in the world. Not a country and government to let something like a Gallup study define them, a full court press of PSAs, commentary from the Prime Minister, etc. aimed at changing perception, and encouraging residents to show they are "happy". I can only imagine the mayor of Philadelphia - or better yet Detroit - trying to sell this ad campaign! (enjoy multiple videos here....and here...and here...and here..and here) - you get the point. While I poke fun at some of these ads, I imagine they are having an impact. I've obviously noticed them. Now, if I can just get Gallup to produce a study stating the price of alcohol is too high in Singapore, and that's what's causing residents to be unhappy...maybe the government will react swiftly and address that domestic issue next! Finding a new appreciation for "Paradise in Malaysia"
Aside from perhaps our first lazy weekend in Bali, we've always tried to experience the local culture, learn some history, and enjoy a little beach and relaxation time during our travels. If you were to ask Jennifer or me to name a favorite destination, it would be quite difficult, but Batu Batu would be close to the top of both our lists. This week, Jennifer and I both gained a much greater appreciation for the tiny island of Pulau Tengah, on which Batu Batu sits, and I felt compelled to share the story. It started when we were discussing one of Sophia's latest homework assignments..."identify and define several events that have caused humans to migrate." This was a follow-up assignment to another from a week or so ago when she worked on tracing back the roots of her ancestors. Thanks for the help on that one Grandmas and Grandpas! Side note, turns out I'm a mix of Prussian, German, and Swiss, and some of Jennifer's relatives are also from somewhere in Eastern Europe / Russia. Makes me wonder why we both hate snow so much?? Anyway - as if her assignment on "causes of human migration" wasn't enough to make me realize how much smarter she is than me, her first few answers regarding European migration to America for better opportunities, and her understanding of the Chernobyl and Fukushima disasters when we discussed them, made it crystal clear. As we discussed other potential causes for migration, I mentioned refugees, thinking mostly about the current situation in Syria. 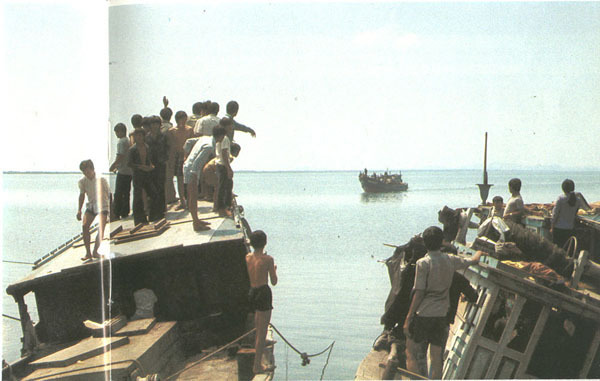 Soon, however, we shifted gears and talked about the 100,000 or more refugees who were crammed onto the tiny island of Pulau Tengah for up to two years at a time as they fled Vietnam in the 1970s. The fact that Sophia had been to the island, and we are visiting Vietnam in a few months, made the lesson that much more impactful and personal. Once we found a few blogs and web pages built and maintained over the last few years by some of the refugees themselves, it became a special, emotional learning experience for all of us. 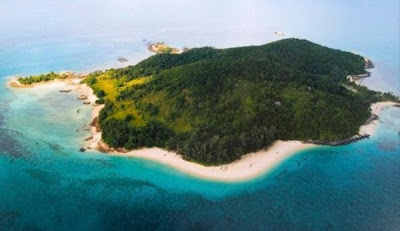 For anyone who read our original post on Batu Batu, you may recall the brief history of the island (Pulau Tengah) on which Batu Batu is located. At only a mile wide and several miles off the coast of Malaysia, the island has been inhabited by only three known groups of people. 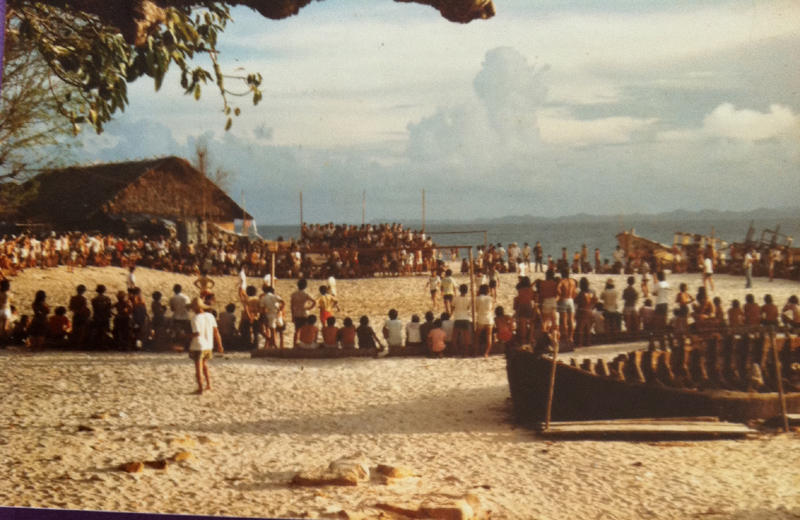 Vietnamese refugees in the 1970s and 1980s, the crew and cast of Expedition Robinson (Swedish version of Survivor) from 1998-2010, and currently, the staff and guests of the Batu Batu resort. As we talked and read about the Vietnamese refugees on Pulau Tengah and other islands in the South China Sea, it really made our relaxing weekends of swimming, eating, and dock diving at Batu Batu seem quite trivial... let alone the filming of a reality show. Several first hand accounts from refugees who successfully reached the islands, spoke of late night escapes from Vietnam on small, overcrowded "mock fishing boats", without any real sense of where they were headed. Anywhere but there, was a better option for many, it seemed. For many, the success of getting past border patrols was just the beginning of a potentially hellish experience. Many died at sea due to weather and exposure. Others met even more sinister fates when they came across pirates or other vessels at sea, who took what they wanted (including women and children) and killed the remainder of the passengers on board. For those who made it safely to one of many islands in the Gulf of Thailand and South China Sea, conditions weren't much better and in some case considerably worse. As I read about several islands off the coast of Thailand, it was clear that death at sea might not have been such a bad end. Needless to say, I didn't share the graphic nature of many of these stories with Sophia...at 10 years old, she's not quite ready for that learning experience yet. For those who were fortunate enough to escape Vietnam, avoid the pirates, and bribe their way past patrols, reaching a UN refugee camp began the transition to a new life in Europe, Australia, or the US. While not all survived long enough to reach their new life abroad, due to poor conditions and lengthy waits for approvals to enter a new host country, hundreds of thousands did. By nearly all accounts I read regarding Pulau Tengah, life as a refugee at the UN camp on the island was significantly better than the alternatives in Thailand or at sea. It obviously wasn't perfect, and a hugely different experience than anything I could ever imagine, but for many, it sounds as though they have very fond memories of what must have been a chaotic, exciting, and terrifying experience. For anyone in Southeast Asia interested in visiting the Batu Batu resort, I hope the stories, photos and commentary makes your visit a little more interesting. If nothing else, it will surely make you appreciate the beautiful experience that awaits you at Batu Batu. For those too far away to make the weekend trip to this beautiful island, I hope the information provides some insight and perspective on just how lucky most of us are. For us, learning the history of the island was both educational and humbling. We realize how fortunate we are to enjoy this island, and are even more anxious to return to Batu Batu (in October) to learn more about the refugee camp and to see first hand some of the artifacts that remain behind, now 30+ years later.